Can Glycolic Acid Improve My Skin? Home > Skin Supplements > Can Glycolic Acid Improve My Skin? Hundreds of products are on the market that promise better skin, but few have garnered as much good press as glycolic acid. Used in many chemical peels, it helps the skin rejuvenate itself and has become part of a regular skin care regimen for many people. Glycolic acid is an AHA, or alpha hydroxy acid, which is used in many skin care products. Because of its very small molecular size, it is the only AHA which is able to easily penetrate through cell walls. When it accomplishes this, it triggers the production of new collagen and plumps up cells to reduce the appearance of wrinkles. It is also able to give skin a smoother appearance by helping to form new keratin cells on the skin's bottom layer. While health supplements taken orally are also thought to boost skin health, there is now a growing body of evidence that topical products containing AHAs, lactic and citric acids can also help skin to repair itself and look and feel better. These products in particular are designed to protect against UV radiation and sun damage, resulting in younger-looking skin. Coming primarily from sugar cane, glycolic acid is used most often as a chemical peel. This can be done in a salon either by a qualified dermatologist or skin care specialist, or using a home kit to produce a DIY facial result. Please be advised that with home kits the concentration of glycolic acid is lower, so results may not be as good. But it will be cheaper! 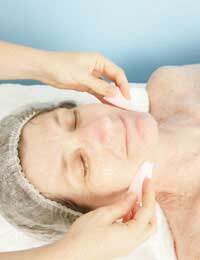 With a salon peel, your practitioner will decide what concentration of glycolic acid is more suitable for you. In most cases, it will range from 20 to 70 percent. The top layers of the skin will eventually separate and fall off, revealing a fresh new layer. Sometimes a peel is used in conjunction with other techniques, such as laser therapy, dermal fillers or Botox. Home peel kits, or glycolic facials, are now available from reputable skin care specialists such as Lancome and L'Oreal. It's advised to go with a well-known brand so you know what you are getting. Follow the instructions carefully to avoid any damage caused by carelessness. Glycolic acid can also be found in other cosmetic products, such as acne gels and special skin lotions, where it works as a natural exfoliant and moisturiser. Again, only buy from a reputable supplier and stick to reputable brands, even though they may be more expensive. Most shops selling health supplements should stock products containing glycolic acid. If you have severe acne or other skin care problems, consult a dermatologist first. Glycolic acid can cause sun sensitivity, so avoid exposure to the sun and use a good suncream after application. People who undergo glycolic acid chemical peels may find their faces very red for a few days after, so cancel your fancy dinner plans and stay home! Also, avoid the sun immediately after and when you do go out, apply plenty of appropriate, good quality sunscreen. Why is Dandelion a Natural Diuretic? What are "Natural Steroids" like Androstendione and DHEA? Why is Co-Enzyme Q-10 Considered a Miracle Supplement? How Can Evening Primrose Oil Benefit Skin? What Are the Benefits of Retinol for Skin?